Approaching YEAR 10 of the Backyard Initiative! Grounded in a simple premise—that active community and cultural connections are the foundation of good health—the Backyard Initiative (BYI) is a dynamic partnership between the residents of 7 neighborhoods of South Minneapolis, the Cultural Wellness Center, and Allina Health. Despite having access to world-class medical care right in their “backyard,” many residents in the area experience poor health outcomes. The Backyard Initiative goes beyond medical care to improve health by improving the capacity of residents to strengthen their own health. As part of the BYI, residents draw upon their own knowledge, skills, and cultural values to take care of themselves and their families, friends and neighbors. This remarkable partnership began in 2008 with a commitment between the partners to sustain this unique initiative for 10 years. The year 2018 will begin the final year of this partnership in its current form, largely funded by the financial contributions of Allina put alongside of the social capital of many residents. This will not hearken the end of the Backyard Initiative, however, as the end of this decade of work approaches! Look for the exciting changes and transformation to the Backyard Initiative that will occur throughout 2018! Community Health Action Teams (CHATs): Most of the BYI’s work is done by Community Health Action Teams (CHATs) that are community-led health improvement projects organized around an ethnic/culturally-defined issue or a specific approach. The CHATs engage community members in activities around the four BYI STRATEGY AREAS: improve health by creating social support, social cohesion, health education and health empowerment. Community Commission on Health (CCoH): The Commission is the main leadership body of the Backyard Initiative and meets monthly. It is comprised of 2 to 3 leaders of each CHAT, Ruth Olkon of Allina, Cultural Wellness Center staff, a couple of representatives from the Community Resource Body. 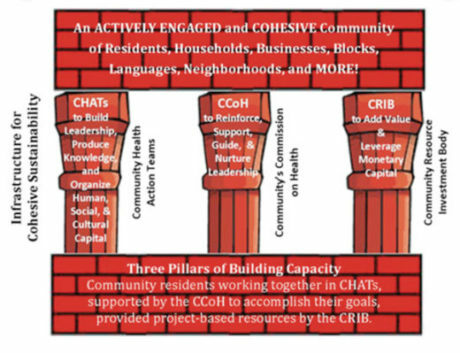 Community Resource Body (CRB): This body of people explores ways to support the Backyard Initiative and to learn about new ways of lifting up the mutual benefit to institutions and organizations when communities are able to participate in health sustenance. Members of the CRB include: BYI Community members, Allina Health, Amherst H. Wilder Foundation, City of Mpls. Dept. of Health, Cultural Wellness Center, George Family Foundation, Hope Community, LISC, North Point Health and Wellness and U of M School of Public Health. The Backyard Initiative (BYI) Resource Center is the central location for the Backyard Initiative activities and communications. It is located inside the Midtown Global Market (near the Lake and 10th Ave entrance). The BYI Resource Center is where all the BYI resources are compiled, displayed, and shared with our community. The Resource Center is a place for community members of the Backyard Initiative to visit, gain knowledge, and share information about activities and resources available in the Backyard. This Backyard Initiative Resource Center is essential to the goal of connecting with the 42,000 members of the Backyard community and to connect them with one another.